San Francisco, California, February 3, 2019 — KMLabs, Inc., the leader in ultrafast laser technology, today introduces Y-Fi NOPA for two-photon fluorescence excitation. With Y-Fi NOPA, researchers are able to reach deeper into dense and scattering tissue, and the unique parameter set means this is also possible with minimal toxicity. Y-Fi NOPA can be used for applications including neuroscience, cancer research, immunology and developmental biology. Two-photon microscopy enables deep image acquisition into dense and scattering samples due to the longer near infrared wavelengths used for fluorescence excitation. In order to achieve the deepest imaging results, high peak powers are required to enhance signal, and low average power is necessary to prevent thermal damage. Y-Fi NOPA uniquely delivers an ideal combination of average power, pulse energy and repetition rate to enable superior two-photon results. Y-Fi NOPA is a wavelength-tunable source from 650 to 1020 nm, covering the ideal wavelength range for a wide range of fluorophores including GFP and RFP. It also provides 80 nJ pulse energy with repetition rates that the user can tune within the range of 1 to 7.5 MHz. This flexibility to select the optimal combination of repetition rate and wavelength, in combination with high peak power, ensures researchers can optimize imaging parameters for the best signal-to-noise ratio with lowest phototoxicity for each and every sample. This is exactly the parameter set that was recently outlined by researchers at Cornell University as being required for optimum deep tissue two-photon imaging (1) and which has not been commercially available until the introduction of Y-Fi NOPA. 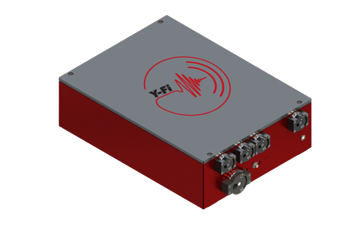 Y-Fi NOPA joins the KMLabs Y-Fi™ family of ultrafast fiber lasers that include the Y-Fi base in standard, high power and “ultra” modes, as well as Y-Fi OPA for three-photon imaging. These systems are engineered as small, briefcase-sized, closed platforms that are expandable to include additional functionality simply by stacking the modules on top of each other. In addition, these Y-Fi lasers come with built-in alignment capabilities to enable remote servicing and maintenance for maximum imaging time with the least amount of fuss. Y-Fi NOPA is being introduced this week at the SPIE BiOS at Photonics West in San Francisco, the world's largest biomedical optics and biophotonics conference at KMLabs Booth #8802. Researchers interested in discussing multiphoton imaging requirements should contact sales@kmlabs.com. KMLabs delivers record-performing ultrafast fiber and Ti:sapphire laser systems designed for high reliability, flexibility, and power. KMLabs offers lasers and parametric amplifiers specifically engineered for biological multiphoton microscopy. In the IR arena, Y-Fi™ OPA and Y-Fi NOPA systems generate fs, high power pulses for deep imaging at video rates. These systems are optimized for 2- and 3-photon imaging and have a broad wavelength range that supports second harmonic, coherent Raman, infrared microscopy, and other modalities to support cutting edge research and diagnostic systems. KMLabs, Y-Fi, Y-Fi NOPA and Y-Fi OPA are trademarks of KMLabs, Inc. Other trademarks that may be mentioned in this release are the intellectual property of their respective owners. Filled under: "two-photon imaging", "multiphoton imaging, "life sciences imaging", "ultrafast fiber lasers"